This is the smell of Sunday morning in our family home. 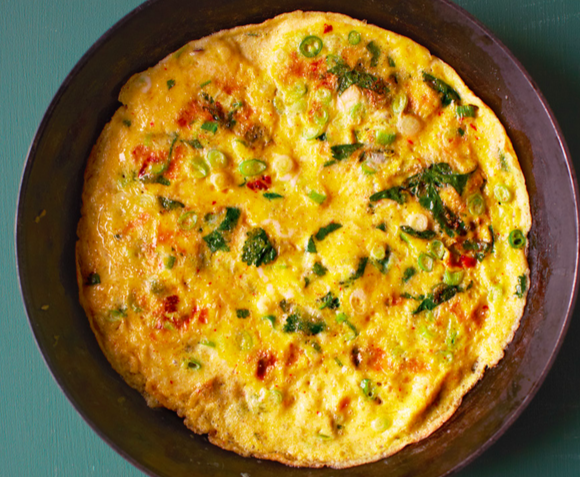 I would follow my nose like a cartoon wolf, down the stairs and into the kitchen, where this tasty omelette would be waiting alongside a pile of hot buttered toast, a fresh pot of chai and Lata Mangeshkar’s timeless, syrupy voice on the stereo. This recipe was first published in Made in India – you can buy a copy here. Break the eggs into a large bowl and lightly whisk until the yolks and whites are mixed. Add the spring onions, green chilli and coriander, along with the turmeric, chilli powder and salt, and mix together. Put a teaspoon of oil into a frying pan (a 20–22cm-diameter pan is ideal) on a medium heat. When it’s hot, pour in a quarter of the omelette mixture and swirl it around the pan so that the bottom is coated, then leave for a minute or so. The egg should be cooked through but a bit soft on top. Flip it over for 30 seconds or so, before shuffling it out on to a plate. Serve by itself, or between 2 pieces of buttered toast, with some ketchup and a Bollywood soundtrack in the background.